Properties in San Diego County average 4.7 out of 5 stars. Property 5: Little Italy House ★Best Deal★ 10BR Sleeps 30!! Property 12: Luxury Home w/ AC! Ideal for Multiple Families, 2 Living Rooms + 4 Car Garage! S. Mission Beach Large Family Home, Sun Deck, Ground Flr Patio, Garage Parking! Property 16: S. Mission Beach Large Family Home, Sun Deck, Ground Flr Patio, Garage Parking! 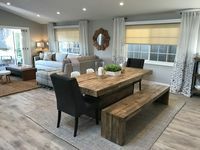 Remodeled Coronado Beach House (Summer Rental). Luxury! Nothing else like it! Property 18: Remodeled Coronado Beach House (Summer Rental). Luxury! Nothing else like it! 5 Bedroom Home - Ocean Views - Hot Tub - Steps to the Beach! Property 20: 5 Bedroom Home - Ocean Views - Hot Tub - Steps to the Beach! TOTALLY RENNOVATED HOME IN PARADISE! Property 29: TOTALLY RENNOVATED HOME IN PARADISE! Stunning dog-friendly villa w/lake views, private hot tub & pool and game room! Property 37: Stunning dog-friendly villa w/lake views, private hot tub & pool and game room! Property 44: Coastal Get-Away Where Summer Never Ends! Beautiful 9 Bedrooms Up In The Mountains With City Light Views..
Property 50: Beautiful 9 Bedrooms Up In The Mountains With City Light Views.. Enjoyed the stay. Mike always responded to any question we had in a timely manner. Had plenty of room both outside and inside. Would stay again when we are in the Vista area. We loved the location. Truly feel part of the village. You can walk everywhere. Great coffee three blocks away. Plenty of space. Worked super well for our large family.